Wood screw #5 x 1inch long phillips round head. Wood screw #8 x 1" long with phillips flat head. Wood screw #5 x 7/8 inch long phillips round head. 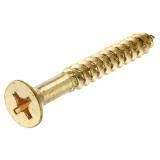 Pan head wood screw #8 x 5/8 inch long tamper proof Torx® with center pin and black oxide finish.